Finally, after over six months of waiting and demanding some kind of evidence that this film isn't just a figment of my imagination, Stephen Chbosky (writer of both the book and the screenplay, as well as the Director of the film) has brought to us the delights of a poster and a trailer. Oooh, I feel giddy with excitement just thinking about it. I read the book about a year and a half ago, and I can't even remember why I read it, or who recommended it, but if you haven't checked the book it, it is a definite must-read, especially for anyone who felt like a bit of an outcast at School. The trailer has left me really excited about this film, and it's not a criticism against Emma Watson at all, but she's really not what I had envisioned for Sam in the slightest. I don't think that will necessarily be a bad thing, because at the end of the day, the film has been put together by the man who owned the original vision for these characters, so if Emma Watson's portrayal was in that vision, who am I to argue with a fellow writer. I do think that it is incredibly refreshing that this film is directed by the author, because at least he can't get angry over the characters and portrayals, as some authors have done in the past. 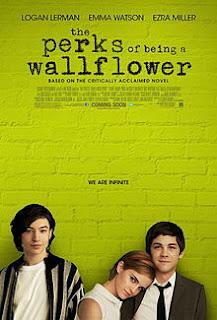 Stephen Chbosky is evidently seeing his baby right through to the end product. Really looking forward to when this film comes out, later in the year.